Sam Beasley has moved to Racing Club after leaving Rugby Town. Racing Club Warwick have further strengthened their side ahead of the 2018/19 campaign with the addition of midfielder Sam Beasley from Rugby Town. The 27-year-old only moved to The Valley in January, joining from Stourport Swifts where he had been captain. Racers boss Scott Easterlow said the fact that Beasley has opted to drop down in level shows the pull of Racers. “Sam is a midfielder who will add enormously to what we already have here,” he said. “I know that Sam has had a few offers from the league above us and higher, so I know it shows that he believes in what we’re trying to achieve this season. The signings of Beasley and fellow ex-Rugby Town player Sean Castleton previously mark a shift in recruitment policy for the Townsend Meadow club after Easterlow opted to scour the local leagues for players in his opening campaign. However, Easterlow said the widening of their search area was inevitable. “We have the best available from around here now so we have to look to improve from a bit further afield. Meanwhile, Racers have finalised their pre-season schedule. 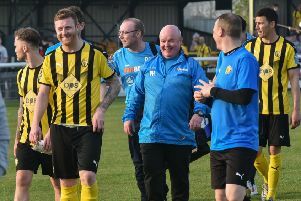 They will kick off at home to Brakes on Tuesday July 10 (7.45) and then travel to Black Country Rangers on July 14 (4pm) before a visit to Coventry Plumbing on July 17. Home games against Coventry United (July 21) and Rugby Town (July 24) follow before a trip to Coventry Sphinx on July 28.